The Kids In Need Foundation, a national, non-profit organization dedicated to providing free school supplies to economically disadvantaged school children and under-funded teachers, is launching the 2013 teacher grants program. All certified K-12 teachers nationwide are eligible to apply. Title I dollars are the foundation of the federal commitment to closing the achievement gap between low-income and other students. Unfortunately, the current formula for distributing funds has led to less poor districts receiving larger per-pupil Title I awards than their higher poverty neighbors. 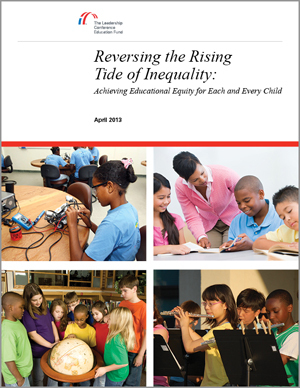 On April 15, 2013, the Leadership Conference Education Fund released their report, “Reversing the Rising Tide of Inequality: Achieving Educational Equity for Each and Every Child,” – a call to action to provide each and every child the education she or he deserves. President Obama’s proposed fiscal year 2014 budget highlights key education investments in early learning, furthering the K-12 reform agenda, college affordability and quality, school safety and expanded opportunities for both middle- and low-income communities, while protecting formula programs for at-risk populations overall. The National Assembly on School-Based Health Care (NASBHC) will bring together hundreds of providers, administrators, educators, and advocates for their upcoming convention to be held June 23 -26, 2013 in Washington DC. Department of Education's Equity Commission Releases, "For Each and Every Child"
On February 19, 2013, the Co-chairs of the Equity and Excellence commission presented their report to Secretary of Education, Arne Duncan. 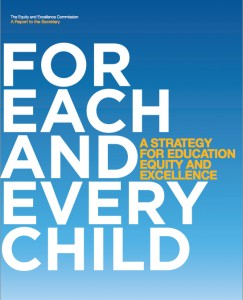 The Commission's report, “For Each and Every Child,” highlights the need to eliminate “education disparities affecting millions of underserved and disadvantaged students.” Rural Trust Executive Director and Capacity Building Director, Dr. Doris Terry Williams was appointed to the Commission in 2011. The featured innovation of this Rural School Innovations Series Webinar from February 2013 was the STAR School, and focused on the "3-to-3rd " Math Project.